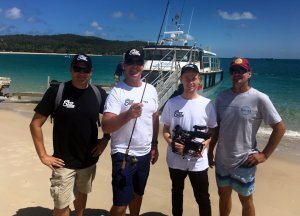 Capricorn Enterprise hosted a visit over the weekend by popular Channel Seven weather reporter Paul Burt (“Burty”), his Producer and cameraman from the Gold Coast, to film a number of segments for his new fishing show to be launched in March 2019. Whilst the windy weather and short time-frame wasn’t conducive to chartering one of our local fishing tour operators, the crew were able to ferry to Great Keppel Island with Keppel Konnections special charter and obtain fantastic fishing footage on the northern side of Great Keppel Island with island resident and keen fisherman “Goodo” from GKI Holiday Village. 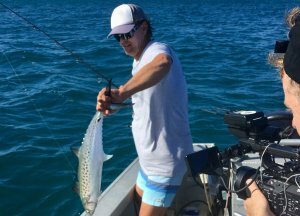 In just two (2) short hours they managed to catch whopper Spotty Mackeral and Trout! The crew then enjoyed cooking their local catch at the multi award winning Waterline Restaurant with the beautiful sunset backdrop of Keppel Bay Marina. 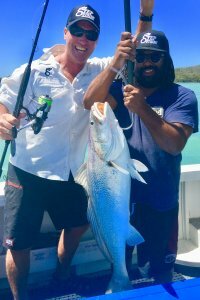 They then met up with our local muso legend and keen fisherman, Jeremy Marou in Rocky (as soon as he flew in from Perth that night! 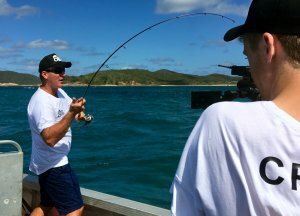 ), to head straight for Stanage Bay, the northern most part of our Capricorn coastline and one of Jeremy’s favourite fishing hang-outs. 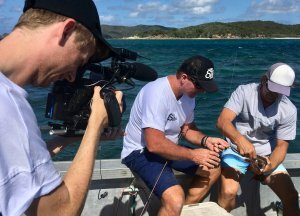 In two nights and one full day, the crew were absolutely blown away by the natural beauty and fantastic fishing, not to mention the amazing accommodation at Plumtree Views holiday house and the great food, local characters and hospitality of Maree and Bevan, owners of the Plumtree Store and Crab Pot Bar! 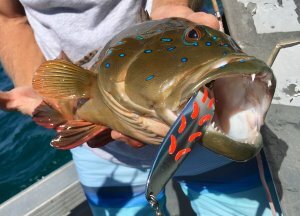 After enjoying just a taste of what the Capricorn Coast has to offer, these guys will certainly be back, next time calmer weather and we can get them onboard a couple of our fishing charter boats to enjoy the estuary fishing of the Coorooman Creek, Corio Bay, the Fitzroy River and much more of Keppel Bay!